Everyone invited, buy a ticket, come and participate in the Foundation class, then stay and watch and learn from the experience! After a year of growth, learning, practicing….and standing, lots and lots of standing, year end assessments are a fantastic opportunity for Tai JI Circle students to demonstrate their progress and receive feedback from Shifu Liu. Reflection is a critical part of practicing Tai Ji Quan and taking a moment at the end of the year to consider what we have accomplished and how we can improve, is exceptionally valuable for our TaiJi. We can also learn by watching the assessments as it is valuable experience. At year end assessments of Chen Taijiquan Shifu Liu provides TJC students direct feedback, and we will present free training awards to students who have made the most improvement over the course of the year. All TJC students are encouraged to participate regardless of experience. Shifu Liu will discuss and demonstrate the basic requirements of Chen style taijiquan before we start the assessments. TJC are very fortunate to have Shifu Liu as our teacher and assessor as he is a very experienced wushu/taijiquan competition judge both in China and the UK and can examine students to the 3rd Duan Wei level of the Chinese Wushu Association. So don’t miss out on his expert feedback. These assessments are intended for regular Tai Ji Circle students, but if you feel you are not ready for assesment yet, or are not one of our regular students but would like to come along join in and watch you are welcome to buy a ticket and come along. Students will demonstrate forms together in groups. Shifu Liu will provide each student a mark and feedback after each assessment. Students may participate in as many assessments as they like. TJC students who have improved most will win our awards, and 2019 membership will be required to use your prize. Awards must to be used during Term One, 7 January to 28 April 2019. (Disciples are not eligible for prizes). 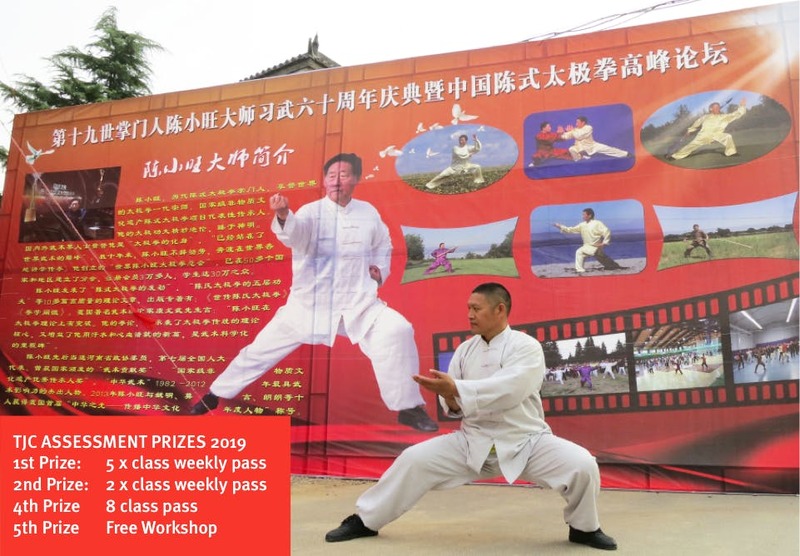 The Assessment prizes will be awarded at our special AGM, with Chen Taijiquan Performances and Xmas Party on Saturday afternoon 15 December from 13:30, to be held at St Paul’s Church Hall, Camden Square, NW1 9XG.